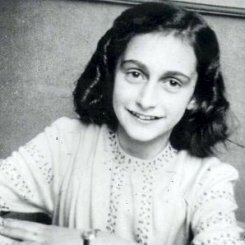 This article is a short account of Anne Frank's history, starting with her early childhood in Frankfurt am Main and until her tragic return to Nazi Germany in September 1944. Certainly, the most dramatic episode of Anne Frank's history is the time she and her family spent in hiding in Amsterdam. She documented this in her world-famous diary, which has now been translated into 60 languages. Tip! Waiting in the queue at the Anne Frank House can take an hour or more. Line up before 9:00am or after 16:00pm. Around these hours, the waiting line is usually less than half an hour. But if you want to make sure you skip the waiting line. Order your ticket online! Make sure you order the ticket a few days in advance. If you try to order a ticket the day before your visit, the chances are they will be sold out. Annelies Marie (Anne) Frank was born on June 12, 1929 in Frankfurt am Main in Germany to a Jewish-German family. Mother Edith Frank Holländer and father Otto Frank already had a young daughter, three-year old Margot Betti. Up to a point, Anne Frank's history is nothing unlike that of other girl of her age. Anne and Margot enjoy a carefree childhood despite their parents being increasingly worried by the deteriorating economic climate and the disconcerting prospect of Adolf Hitler's political rise. Anne and her family lived in Frankfurt am Main until 1933, the year Adolf Hitler came to power as the Chancellor of Germany. The unprecedented rise in discrimination against Jews then compelled the Frank family to flee the country. Due to a family connection, (his brother-in-law Eric Elias) Otto Frank finds out about the possibility of starting a business in Amsterdam and moves to the Netherlands in March 1933. The rest of his family will follow soon after and for several years will benefit from a period of relative tranquility. Otto Frank company, named Opekta, sells a gelling agent used in the preparation of jam. Later, in 1938 with the help of Hermann van Pels, a fugitive Jew from Osnabrück (Germany), Otto sets up a new company named Pectacon that produces spice mixtures. However, things take a dramatic turn for the Anne Frank's family after Nazi Germany invades the Netherlands in 1940. Shortly after, Amsterdam's Jews will be confined to certain parts of the city and forced to wear the yellow star in order to be distinguished from the rest. At the end of 1941 Otto Frank is compelled to resign as director of his two companies and re-register them on the name of his Dutch friends to prevent them from being confiscated as Jewish-owned companies. Their assets will be transferred to Gies & Company, headed officially by Jan Gies and their offices moved to Pinsengracht 263. News brought by Otto Frank's employees seem to indicate that the massive landing of the Allied troops in Normandy will bring victory. Yet soon the hopes of the eight people in hiding are scattered: after two years spent in hiding, in August 1944 all people in hiding are arrested and deported to several concentration camps. One year later, after being sent to the Bergen-Belsen camp, Margot and Anne died of typhus, a few weeks before the British troops liberate the camp. 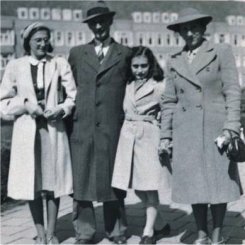 In 1945 Otto Frank, the only survivor of the family, returns to Amsterdam where he receives Anne Frank's diary that had been recovered by Miep Gies. The diary is published in 1947 with the title Anne Frank: the Diary of a Young Girl. Today Anne Frank's history is known worldwide. More than a personal story, her history stands as a reminder of things that should never be repeated. Anne Frank's hiding place, Prinsengracht 263 including the Secret Annex, have been preserved as the Anne Frank House. 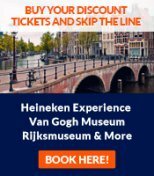 With 1 million visitors per year, it's now among the 3 best visited Amsterdam museums. Read more about about visiting the Anne Frank House in Amsterdam.